Honoring the First UN International Day of the Girl Child at Ms. Magazine’s 40th Anniversary Luncheon at the Washington Press Club. It was a huge honor, and so much fun, to celebrate the first United Nations International Day of the Girl Child at Ms. Magazine’s 40th Anniversary Luncheon at the Washington Press Club in downtown DC. Founder of Ms. Magazine & Feminist Icon, Gloria Steinem, Listening to my Speech at the Ms. Luncheon. Beyond Honored & Surreal. Sandwiched between my feminist icons, Eleanor Smeal and Gloria Steinem, I had to express my honor and disbelief at this amazing moment: Speaking on the same stage as Gloria Steinem on the 40th Anniversary of Ms. Magazine? 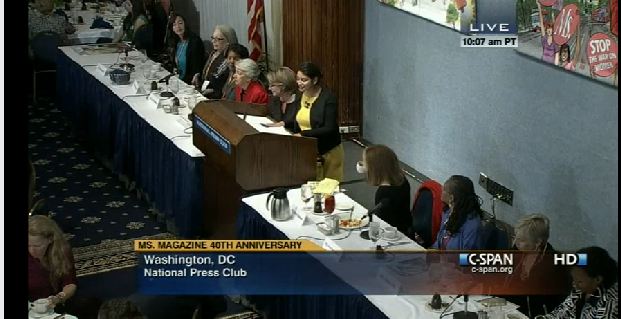 The Ms. 40th Anniversary Luncheon Panel at the Washington Press Club Included Eleanor Smeal, Kathy Spillar & Gloria Steinem. I am still in shock. I do not think I felt my feet touch the stage the entire time. I Was So Grateful & Happy to Have This Moment in My Career. 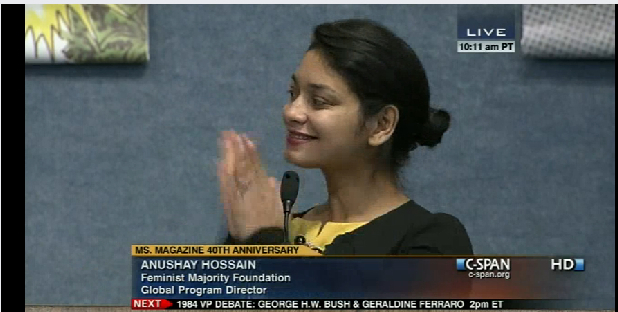 I Was Also Very Proud of My Colleagues at the Feminist Majority Foundation & Ms. Magazine, and Humbled By Them. I spoke about child marriage, Malala Yousufzai, and the Feminist Majority Foundation’s newest global program, Girls Learn International (GLI), an international advocacy education program partnering girls schools around the world. To catch Kathy Spillar, Ellie Smeal or Gloria Steinem speak, watch the full show here. Enjoy!